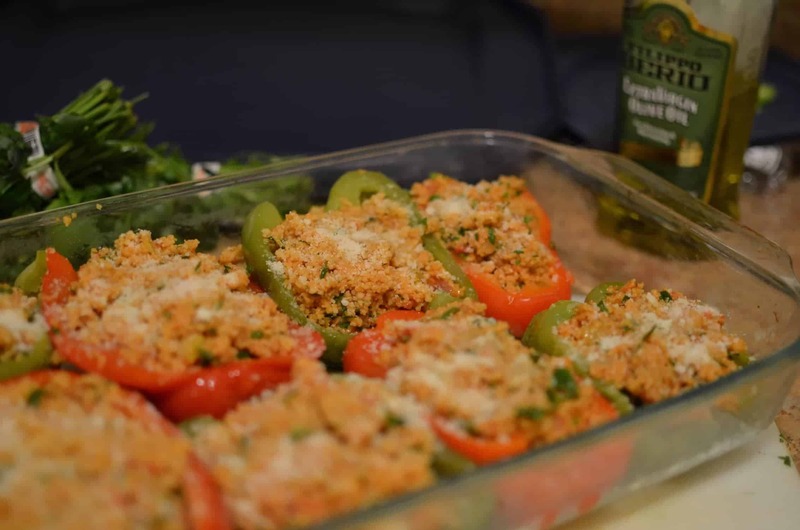 I love the idea of stuffed peppers, pumpkins, squash, ect. There is something so classic and fall-friendly about stuffing produce and then baking it! I was at the farmers market this past week and saw these gorgeous peppers. I thought they would be perfect stuffed with the rage I made the previous evening. I’m usually not that concerned with calories (thank you plant-based diet! 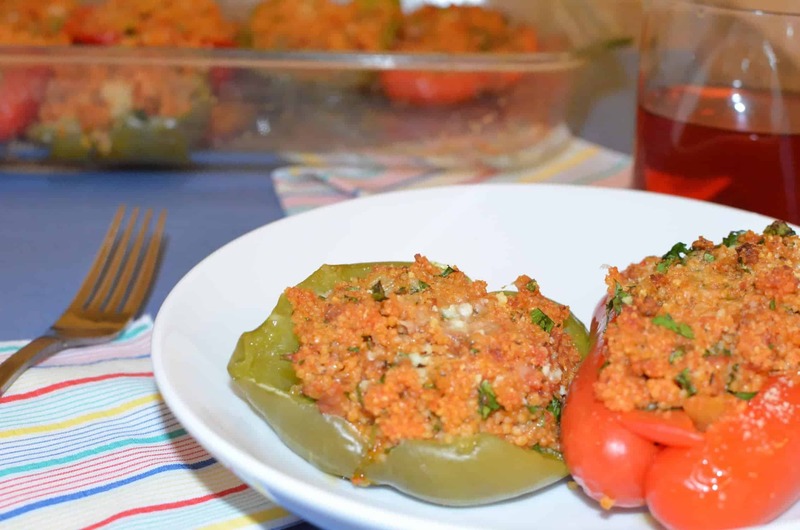 ), but the other nice thing about stuffed peppers is that they are very filling without adding extra calories. I added couscous to these, but you can do quinoa to make it gluten-free or double the ragu to stuff with instead. Mmmm. Flavorful, colorful, these peppers are also BL approved. Quite the stamp in my opinion. Healthy, ‘man food’ doesn’t get much better than this. 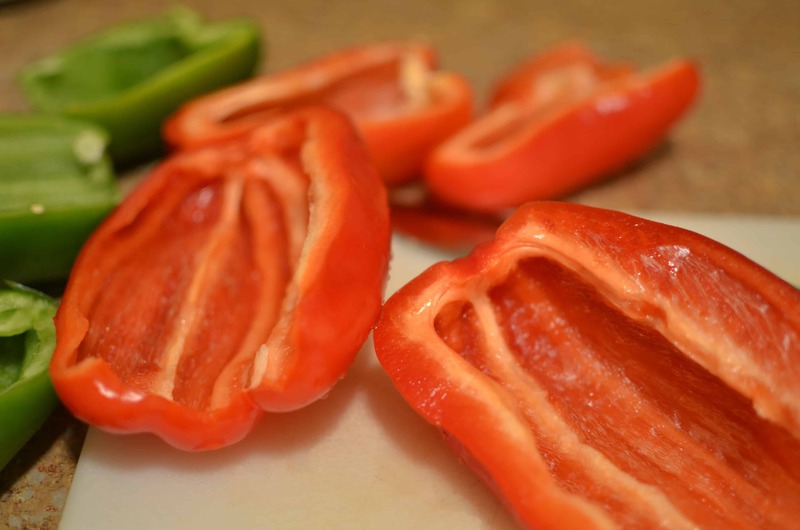 To prepare: Cut tops off peppers; remove seeds and membranes. Rinse peppers under cold water. Place peppers in a large pot; cover with salted water. Bring to a boil; reduce heat, cover, and simmer for 10 minutes, until slightly soft. Drain peppers and set aside. Whisk together 1 tbsp. olive oil and 1 tsp. vinegar, the tomato paste and 3/4 cup water. Pour into the bottom of a glass baking dish. In a large saute pan, add the couscous and 1/2 cup water. Stir and let cook for 3 minutes until al dente. Add the ragu, parsley, basil, remaining red wine vinegar & cheese. Place the peppers into a baking dish, cut side up. Stuff the couscous mixture into the bell peppers. Cover the dish with foil and bake until the peppers are tender and the filling is hot, about 25 minutes. Drizzle with remaining cooking liquid. In a food processor, pulse together the garlic, onion, celery, carrot, and rosemary. Heat the olive oil in a large sauté pan over medium-high heat. Add the chopped vegetables and cook, stirring, until softened about 5 minutes. Add the crumbles, 1 teaspoon salt and 1/2 teaspoon pepper and cook an additional 5 minutes. Add the tomatoes & 1/2 cup water. Bring to a boil, then reduce the heat and simmer until slightly thickened, about 10 minutes. Previous Post: « Prop 37 didn’t pass, now what?